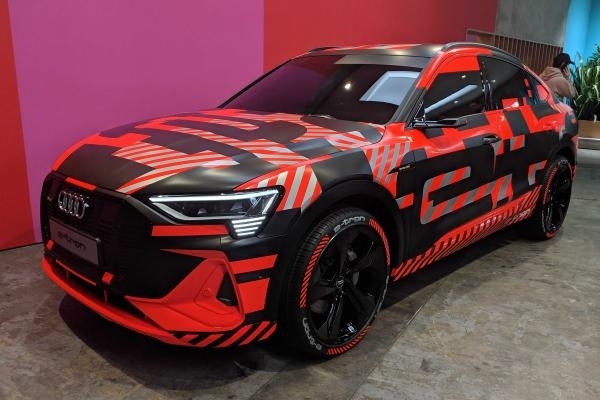 We’ve already seen a concept and spy shots of the Audi e-tron Sportback but now the production car has been revealed at the 2019 Geneva Motor Show – albeit in light disguise. The new coupe-inspired all-electric SUV looks to expand into the BMW X4 and Mercedes GLC Coupe’s market, offering a sporty zero-emissions alternative to the premium mid-size SUV regulars. Audi’s new e-tron Sportback will sit on the same underpinnings as the standard e-Tron, which uses an adapted version of the Volkswagen Group’s MLB platform. 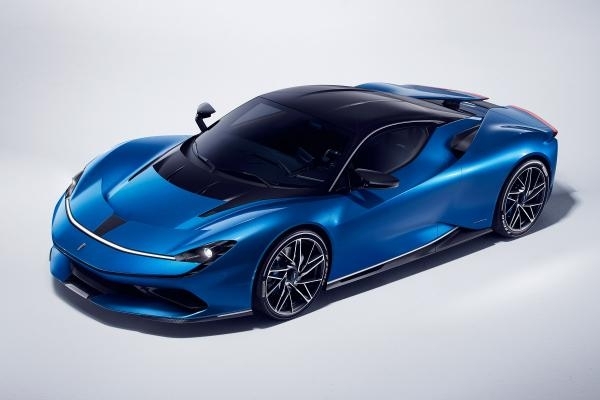 As such, it will have an electric motor on both the front and rear axles, producing respective power outputs of 168bhp and 188bhp. Like the standard e-tron, the system will also provide a “boost” function, offering a maximum output of 402bhp for up to 10 seconds. The same battery pack and charging system will also feature, following the e-tron’s brief as a long-range all-electric car. We’re expecting the same range of at least 248 miles on the WLTP cycle, as well as a sophisticated energy recuperation system and support for 150kW fast-charging. However, given the slightly more aerodynamic rear end, the e-tron Sportback could boast a little extra range. Inside, the e-tron Sportback will receive the same setup as the conventional e-tron SUV with twin touchscreen controls and Audi’s 12.3-inch digital gauge cluster as standard. Optional extras will include wing-mounted cameras in place of conventional rear-view mirrors and kerb cameras. Practicality will take a hit over the standard e-tron, with the Sportback’s sloping roofline encroaching on rear passenger and boot-space. 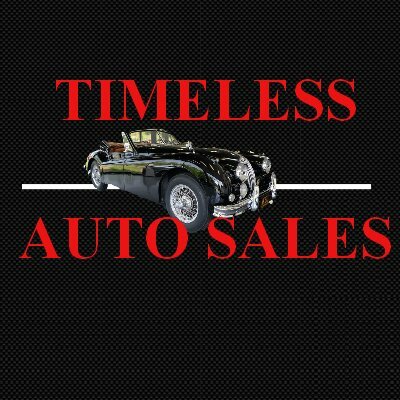 The 600-litre boot capacity will probably lose around 70-litres or so, but the handy 60 litres of load space under the bonnet will be retained. Like the conventional e-tron, we anticipate that just one trim level for the Sportback will be offered in the UK from its likely launch in 2020, with an S Line and Vorsprung edition to follow later. 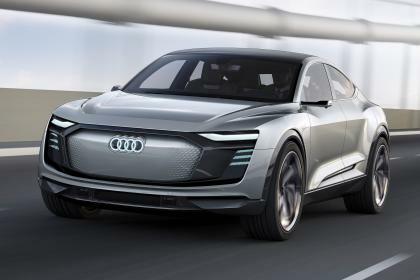 The Audi e-tron Sportback was first shown as a concept at the Shanghai Motor Show in 2017. Proportionally, the e-tron Sportback concept is a similar length to an A7, but at 1,530mm tall it’s roughly the same height as a Q2. Neat design tricks such as the two-tone black and silver roof help mask the concept’s inflated proportions, while the sunken bonnet and inverted front grille will become trademark e-tron design cues. Designers developed a new lighting system for the e-tron Sportback. For the first time the Audi logos on the front and rear were made up of LEDs, while the Matrix LED headlamps were fitted with tiny Matrix projectors which can display graphics onto the road to tell other motorists and pedestrians which direction the car will be turning. The lighting theme continued inside, as the e-tron Sportback was the first vehicle to use electro lighting surfaces. 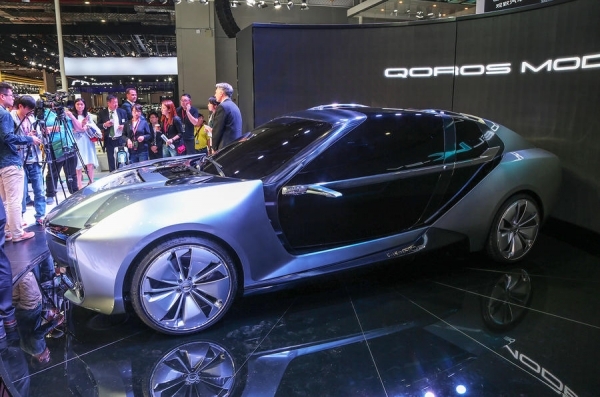 A special material no thicker than 0.02mm is connected to the car’s onboard electrics system and illuminates when the car is started. In the e-tron Sportback the material is used on the centre console and sections of the seats to create an sense of lightness and space. Elsewhere inside, two hi-res digital displays make up the dash and centre console. Both feature haptic feedback, with the only physical buttons in the cabin located on the gearlever selector. As small digital cameras have replaced the conventional wing mirrors, Audi has fitted small digital displays in the upper sections of the doors which relay the visuals to those inside.